The PAC-12 begins their first season with new members Colorado and Utah on board, along with a lot of excitement and improving teams all over the western side of the country. Some of the same storylines persist into the new two division alignment: the inequity of 9 conference games giving some teams 5 conference home games and some 4, USC is still banned from post-season play including a conference championship game, and Oregon and Stanford attempt to stay on top of the pack. Last season only four teams made bowl games in a ten team league, but that was affected by USC finishing 8-5 and not going to a bowl. Expect better things this season including improvements in non-conference record. Time will tell if the Pac-12 goes to a 10 team league schedule, but the experiment of two divisions and nine conference games will be interesting to watch as a unique situation not seen before. Mike Belotti might have put the right players in position for Chip Kelly, but Kelly has done an outstanding job leading Oregon to a Rose Bowl and a BCS Championship in his first two seasons. In year number 3 at the helm, Kelly will need to reload with only 11 starters returning. However, the Ducks have more than enough talent to be favored to win the conference once again. QB Darron Thomas and RB LaMichael James return to lead the explosive Ducks offense once again. Although Kenjon Barner also returns to help the running game, Kelly likes to have at least three backs to split time and he needs to find a third in fall practice. The offensive line replaces three starters but each of the replacements has had significant playing time and will not cause a massive dropoff from last year's amazing numbers. Oregon's defense usually stuffs the run and last year was no different. The defensive line loses three starters with 33 tackles for loss among them, but sophomore tackles Ricky Heimuli and Taylot Hart showed that the line will not drop much production after spring ball. The defensive backfield is the strength of the defense with three returning starters, but they will be affected by all the new starters in the front seven. Expect Oregon's defensive numbers to take a slight dip, which may open the door for an upset or two when the offense has an off night (such as at California last year). The schedule has a brutal beginning against LSU in Arlington, and an even worse end with at Stanford, USC, and Oregon State in consecutive weekends. However, Oregon will still win some of these games and all the rest to make it back to a BCS bowl in all likelihood. Thanks to deft coaching by Jim Harbaugh and excellent play on both sides of the ball, Stanford completed a five year turnaround from worst in the conference to the BCS. 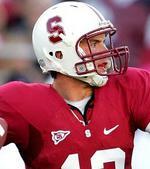 When Stanford throttled Virginia Tech in the ORange Bowl and received news that QB Andrew Luck would return for his junior season, Stanford immediately became a serious contender once again in the newly formed Pac-12's inaugural season. Luck threw for over 3300 yards and 32 touchdowns last year and will likely pass John Elway for the second most passing yards in school history by the end of this season. If that happens, Luck may find himself moving up a slot in the conference standings and in Heisman voting this season (#2 in each in 2010). Luck is a tough nosed runner when he has to be, but RB Stepfan Taylor will be the primary running threat once again. Although some of the offensive line is being replaced, the real question mark is whether the new crop of receivers will be able to pan out for Luck. The only truly daunting game on the schedule before the end of October is at Arizona in week 3, so both tight ends and both receivers will have plenty of time to get on the same page with Luck before the schedule turns tough. The defense has to reload on the line with three new starters and also loses their top cover cornerback. However, the defense should remain effective enough to allow Luck and the offense to feel little pressure in keeping up with the opposition. Despite the easy schedule overall and getting Oregon at home, the loss of Harbaugh will likely force Stanford to take a small step backwards in 2011. However, a division championship is possible with a win over Oregon on the farm. After being mired in the middle of the pack for the past three seasons, Dennis Erickson has the Sun Devils in position to take full advantage of the new divisional alignment in the Pac-12's first season. Arizona State returns 15 starters from a team that finished relatively strong to end up 6-6 in 2010. QB Brock Osweiler split time with Steven Threet a season ago, but he will be the main man this time around. Osweiler also makes some plays with his legs and will be a nice complement to running backs Cameron Marshall and Deantre Lewis. The running game should continue to improve behind a line featuring five returning starters and four seniors. All of the starters on offense except for LT Evan Finkenberg have multiple years in the Erickson system and should produce many more points than any team since the 10-3 2007 team. The defense also has a lot of strong senior leadership returning including linebackers Colin Parker and Brandon Magee. The best linebacker in the conference may be junior Vontaze Burfict, who will likely overcome his 90 tackles from a season ago. A couple new starters get plugged into the backfield and the defensive line, but the solid core of linebackers in the center of the defense should lead to improvement. The Sun Devils miss Stanford and go to Oregon, but have all winnable games otherwise with USC coming to Tempe. Arizona State has the best team in the South outside of USC and should win the division with all this senior leadership. Lane Kiffin continues the road to redemption for USC after a respectable 8-5 finish in 2010 in year 1 of the postseason ban and scholarship reductions. Although Kiffin was not able to run a spring game due to lack of depth, he has vowed to work in many more young players to improve how fresh the star players are in late game situations this season. Junior QB Matt Barkley has thrown for over 2700 yards each of his first two seasons and is on pace to rank among USC's best quarterbacks in school history. The running game will also likely improve despite three new starters on the offensive line. Look for senior Marc Tyler to split time with Dillon Baxter and DJ Morgan, with fewer FB-blocked running plays in 2011 than in 2010. The defense returns 7 starters including FS T.J. McDonald, who led the team with 89 tackles a season ago. McDonald also added 3 interceptions to go with 4 more from CB Nickell Robey, who could be a future superstar if his sophomore season is a step up from his freshman campaign. The defense will need more big plays from the experienced defensive backfield so that the new starters in the front seven can make a few mistakes but not cripple the team. USC has a tough road schedule with Arizona State, Notre Dame, and Oregon on the road. Nonetheless, USC has enough talent even in its depleted state to win every game it plays. Look for USC to finish at or near the top of the division, whether or not a conference championship game is available in December. Rick Neuheisel spent only four years in his previous two coaching stops, so he knows the time to win is now at his alma mater entering his fourth season here. UCLA stumbled to a 2-7 finish in Pac-10 play in 2010 but returns 17 starters and has a new attitude with new coordinators Mike Johnson on offense and Joe Tresey on defense. Both of the quarterbacks who split time a season ago return for their junior seasons: Kevin Prince and Jonathan Franklin. Prince will likely win the starting job back after losing it due to injury in 2010, and he will have all of the same skill position talent to deliver the ball to as last season. Jonathan Franklin nearly averaged 100 yards per game on the ground a season ago and will be a primary driving force in the continued improvement of the offense. UCLA needs to captialize better on their opportunities, as a 20 point per game average will not get it done for winning the division. The defense took a big step backwards last year but returns 8 starters and should be better. The defensive front gave up over 200 yards per game a season ago, but the defensive line should improve dramatically with the addition of Nate Chandler to join the end rushers Owamagbe Odighizuwa and Datone Jones. UCLA avoids Oregon and has a winnable set of home games outside of a non-conference showdown with Texas, so a winning record should be expected this year. If a couple of breaks go their way, the Bruins could surprise and be in the conference championship. The Wildcats started 7-1 and rose to #13 in the country before the wheels fell off in five straight losses to end the 2010 season. Mike Stoops will need to have the Wildcats ready early as September features back to back to back games against Oklahoma State, Stanford, and Oregon. Following that murderer's row are road games at USC and Oregon State, so it is conceivable that Arizona could start 2-4 or even 1-5. However, the back half of the schedule only features one very tough game at Arizona State and should be conductive to going on a run to a bowl game. The offense and defense each returns five starters, but the primar focus will be replacing eight of nine starters on the line. Stoops believes he has some good young talent stepping in and hopes they will have enough depth to survive the tough early stretch of the schedule. Nick Foles threw for nearly 3200 yards and 30 touchdowns a season ago and will continue to throw the ball all over opposing defenses this season. Keola Antolin needs to improve the running game this season, but that could be difficult with such a green offensive line. The star of the defense should be LB Paul Vassallo, who eclipsed 100 tackles and had 6 tackles for loss in 2010. Assuming Arizona survives the first half of the season, another bowl appearance should be on the docket. Mike Riley has only suffered through two losing seasons at Corvallis, and last year was the second. However, OSU had to play three virtual road games against BCS bowl level competition (TCU and Boise State in non-conference play) as well as Oregon at home. The non-conference becomes significantly easier with only a road trip to Wisconsin being a tall task. The offense returns 8 starters from a unit that took a major step back in 2010, losing almost 90 yards per game of production from 2009. RB JaQuizz Rodgers is gone, but his brother James will help lead a strong receiving corps including Markus Wheaton and Joe Halahuni. Ryan Katz threw for over 2400 yards a season ago and will benefit from all of his talented receivers, but he needs to cut down on the 11 interceptions from a season ago. The defense only returns four starters, but that may be a blessing in disguise after a significant dropoff on that side of the ball in 2010. Lance Mitchell and Brandon Hardin anchor the defensive backfield with solid coverage and will hope to not rank among the team leaders in tackles this season (ideally, the defensive line and linebackers will make more plays). Despite all the new faces on defense, most are juniors and seniors that have seen playing time in the past two seasons. The special teams will also be a strength behind James Rodgers and senior punter Johnny Hekker. Riley nearly always exceeds expectations, although it will be tough to finish better than third in a division featuring Oregon and Stanford this season. After leading Utah to six straight winning seasons and three straight ten win seasons, Kyle Wittingham now leads the Utes into a new era and a BCS conference. Wittingham received a nice schedule to start the Pac-12 era, with Oregon and Stanford missing from the docket. However, the step up in weekly opponent difficulty will be a tough transition that will push Utah back down below the double-digit wins mark in all likelihood. Seven starters return on offense including QB Jordan Wynn, who thre for 2300 yards a season ago. Wynn will need to take advantage of defensive backfields unused to him and avoid the 10 interceptions that led to a couple losses in 2010. Freshmen RB Harvey Langi and FB Jake Murphy will now be turned to for leading the running game, which has been steady under Wittingham's guidance. The defense replaces half the defensive line and the entire defensive backfield. Thankfully the entire linebacker starting lineup returns, led by seniors Chaz Walker and Matt MArtinez. Walker and Martinez will be critical to reading all the new opposing quarterbacks the Utes will face this season. Utah will probably win a couple games thanks to the conference being unfamiliar with them, but a couple losses may also occur for the same reason. Utah will likely finish in the middle of the pack until they figure out some of these opposing teams. Steve Sarkisian led the Huskies back to their first bowl game in 8 years last year, and they avenged an earlier loss to Nebraska to finish 7-6. Despite losing QB Jake Locker, the Huskies should continue to improve as a team with 15 returning starters and a manageable schedule. Keith Price outgunned his competition by a wide margin in the spring and will start the year behind center. Price will benefit from new speedster freshman receive Kasen Williams and senior receivers Devin Aguilar and Jermaine Kearse. RB Chris Polk will continue to try and improve on his 1465 rushing yards form a season ago, as Washington needs to maintain the balance in their offensive attack to keep opposing defenses off guard. The defense returns eight starters including four with starting experience on the defensive line. Look for UCLA transfer Josh Shirley to be disruptive with a speed rush from one end of the line. Three seniors in the defensive front seven will also be improved run stuffers: linemen Everrette Thompson and Alameda Ta'amu and linebacker Cort Dennison. All of the major players return from a disappointing special teams unit, so expect improvement in that phase of the game as well. Although Washington should once again have a good chance at bowl eligibility, the Huskies doe not look like any threat to the North division's upper tier. Jeff Tedford enters his tenth season at Cal with an unusual sensation: that being coming off a losing season for the first time at 5-7. Despite having eventual conference champion Oregon on the ropes at home where Cal was 4-0 at the time, the Ducks escaped Memorial Stadium with a win and Cal never recovered. This season Cal will play all home games at the home of the baseball Giants, AT&T Park, so the homefield advantage is dissipated for one season. This is bad news for a team that has struggled mightily in the past five years on the road. The offense returns seven starters and must improve from the 334 yards per game average from a season ago. Junior Zach Maynard will likely take over at quarterback and is capable of making plays with his feet as well as his arm. A new running back will also be plugged into Tedford's offense, and Isi Sofele appears to be the leading candidate in fall practice. The offensive line is stacked with highly recruited and rated players, but the offense will go only as far as Maynard and Sofele can take them. The defense was hot and cold last season, and several freshman and sophomores now join the starting ranks to try and infuse some consistency. Two of these freshmen will hold all important outside LB positions in the 3-4 defense: Cecil Whiteside and David Wilkerson. Senior punter Bryan Anger is a favorite for the Ray Guy award and may help the Golden Bears stay out of trouble if the offense falters. Cal travels to Washington, Oregon, Stanford, and Arizona State, so the Golden Bears have a lot of work to do at "home" in order to regain their winning ways of the past decade. This could be the worst year of Tedford's tenure. Having only won 1 of his first 25 conference games as head coach, Paul Wulff may have seen the corner turn finally for the beleagured WSU program in a 17 point upset of Oregon State at Corvallis last November. However, the Cougars will need to come a long way to be competitive on a regular basis in the new Pac-12. Fifteen returning starters should help the cause, including QB Jeff Tuel. Tuel threw for nearly 2800 yards and 28 touchdowns a season ago. However, Tuel will need more help from the running game, which has not averaged 100 yards per game in any of Wulff's three seasons. Senior Logwone Mitz and freshman Rickey Galvin will likely find better holes to run through with four senior offensive linemen leading the charge this season. The defense returns eight starters and should continue to close the gap in yardage per game from the -140 in 2010 and even worse numbers in 2008 and 2009. The Cougars will only have two senior starters, so this year could be a stepping stone to a defensive breakthrough in 2012. Despite the horrid past three seasons and the continuing rebuilding job in Pullman, Wulff will at least take a small step forward this season in wins. Colorado scuffled to five straight losing seasons under Dan Hawkins and now will give first time head coach Jon Embree a chance to take over as the Buffaloes head into a new conference. By a quirk in scheduling, Colorado will actually play TEN games against conference opponents thanks to having a pre-scheduled game against Cal that will not count in the conference standings. Add road games at Hawaii and Ohio State in a schedule with no byes for 13 weeks, and Colorado may not be wellset up for success in the first season of the Pac-12. One bit of good news is that Colorado returns 16 starters and 9 of those on offense. Tyler Hansen split time at quarterback with Cody Hawkins last year but that will not happen in his senior year. Hansen likes to spread the ball to many different receivers, so Pac-12 defenses will need to cover al of Colorado's receivers equally well to stop the Buffaloes. Rodney Stewart led the rushing game improvement last season and will continue to receive most of the carries, but Brian Lockridge should also see some action. The defense has a nice mix of sophomores, juniors, and seniors who should improve on last years unit that gave up 400 yards per game in 2010. Embree will receive a grace period that may be longer thanks to getting used to the new conference, and that is a good thing because Colorado is probably the worst team in the South division this season. The Pac-12 will enjoy their first conference championship with a relatively interesting division race on both sides. Although Oregon and Stanford are probably the class of the league, USC and the four teams competing for the South division title are all close in talent and could upset the Ducks or the Cardinal in a single game scenario. The Pac-12 will benefit from the extra national exposure the first weekend of December, and perhaps will even have a chance to send one of their two BCS bowl teams from a season ago back for another shot at the BCS Championship. Even if that is not the case, Oregon and Stanford being in the same division will likely help the league grab two BCS berths again assuming both are still ranked in the top 10 at the end of the season. It will also be interesting to see how Colorado and Utah, two teams headed in different directions, handle the new competition. The Pac-12 may not have taken as big a step forward as their rival the Big Ten, but both leagues will benefit greatly from the championship games starting this season.